This walk, or a similar walk, is available to download from our Videowalks web site for just £1.49. The video walks take the form of detailed slideshows (typically around 20 minutes each) taking you all around the route, along with photographs and video clips of what you can see along the way. The walks also come with printable directions in pdf format, including a 1:25,000 Ordnance Survey map excerpt showing the route and photographs showing key directions. A circular from the Ribblehead Viaduct over one of the 'Yorkshire Three Peaks'. The walk follows the 'Three Peaks walk' path for most of its route, initially following alongside the Settle to Carlisle railway line, before heading up on the path towards Dent. The path then steepens over Knoutberry Hill before following a wall along to the summit of Whernside. The panorama from here ranges from Pendle Hill to the South, round to the Morecambe Bay and then the Lakeland Fells and the Howgills. The return is via a steep drop down to Bruntscar, before leaving the 'Three Peaks path' to turn left eventually passing Winterscales to come out through a tunnel under the railway. The outward path is then followed for the short journey back to the parking area. Parking: Roadside laybys near to the 'T' junction of the B6255 and the B6479 (grid reference SD 765 792) - further parking is available near to the Station Inn, but please park responsibly as it can get very busy around this area, especially as weekends. The walk starts at the junction of the B6479 and the B6255. There is plenty of roadside parking available around this junction, and usually refreshments in the form of a hot food van. A path leaves the junction of these two roads from behind the signpost at the junction and heads across towards the viaduct. Follow the footpath heading across to the viaduct. This path soon meets a track which meanders down under one of the twenty-four arches forming the viaduct. On the last bend before the arches, take the grassy path that leaves the track to the right, to head up towards the wall on this side of the railway track. As this grassy track is walked along, there is an excellent view back to the left of Ingleborough effectively being framed between the railway arches. The path climbs some steps about thirty yards to the right of the wall, then continues on slowly drawing in towards the wall. After a few hundred yards a path goes off to the left under an arch under the railway. Ignore this and continue ahead following sign "FP Whernside". Continue ahead and over a wooden stile. The full magnitude of Whernside can now be seen. From here all of the 3 peaks (Ingleborough, Whernside and Pen-y-ghent) can be seen. With the signal-box now straight ahead, a bridleway comes into the footpath from the left under an arch which is the return route home. Ignoring this, continue past Blea Moor signal-box then over a small stream using three large stepping stones and continue ahead in the same direction. There is probably not a signal-box in the country with more glorious views than this one. The path bends around to the left and goes over a walled aqueduct then over a wooden stile. From the bridge the trains can be seen disappearing into the tunnel in Smithy Hill. Over the bridge, the path bends around to the right, and heads uphill heading for the fencing that can be seen about one hundred yards ahead on the horizon. Whilst walking up this stretch the Force Gill waterfall can be seen over to the left-hand side. Upon reaching the fence, go over the stile and turn left onto a path that starts climbing steeply uphill. Continue up this man-made path for about a third of a mile, where a footpath sign is reached stating "BW Ribblehead 2 miles" in the direction the walk has just come from, "BW Deepdale 5¾ miles" in the direction continuing up the hill, and "FP Whernside 1¾ miles". Go over the stile and walk directly away from the fence following the sign to Whernside. The path is very well walked and is the one that leads all the way to the summit of Whernside. After about ten minutes on this path, the path crosses over a small stream and pulls in alongside a wall, as it continues it's climb uphill. The path follows this wall for a few hundred yards, before heading off diagonally left now onto a man-made path. This path is constructed of large stone slabs to try to prevent erosion of the footpath. In misty conditions these slabs are an excellent navigational aid. After a further fifteen minutes walk the path again pulls in to the wall. The path now follows at the side of the wall all the way up to the summit. The triangulation point on Whernside is slightly hidden on the other side of the wall through a small gap in the wall. 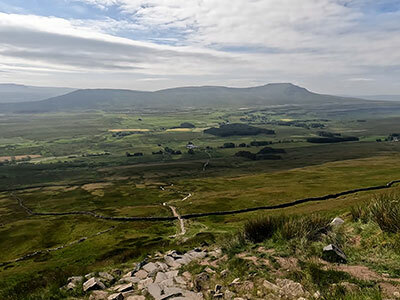 There are excellent views all around from the summit here with Whernside being the highest in the Yorkshire Dales. Continue on past the summit and follow the path on it's initially slow descent downhill, still continuing on in the same direction. The drops down the front of the hill from here are very steep. After a couple of hundred yards go over a stile and continue on following the side of the wall. The Ribblehead Viaduct is now visible down below, and beyond that is Pen-y-ghent. A further six hundred yards on the path starts to descend much quicker for about fifty yards then flattens out before again descending much quicker. Down to the left the path home can now be seen emanating from the farm below on a line with the tree plantation. The path again briefly flattens before descending much steeper for about fifty yards. At this point at the bottom of this drop, the path veers off perpendicular away from the wall, to start it's much steeper descent off the side of Whernside heading for the farm and the tree plantation. The path may not be so obvious from the top, but after about fifty yards the path is very well worn on the steeper section. Sections of this path are actually man-made steps. Continue downhill and go over either of the two stiles on the wall. Continue on the path over a further stile heading for the farm below. Climb over another stile by a farm outbuilding, then almost immediately as the path meets the track, turn left through a gate following the sign "BW Winterscales 1¼ miles". Head now back alongside the bottom of Whernside across a field heading for a farm ahead. Go through a gate in the corner of the field, to pass in front of the farmhouses. Continue straight ahead, and then upon leaving these buildings, continue along the same line, heading for a single tree next to the wall ahead. Go through the gate in the wall, twenty yards to the left of the tree, then follow the side of a wall for about fifty yards and out through the next gate. Continue on in the same direction heading for the houses ahead, passing through yet another gate on the way. Once through this gate, go over a small wooden footbridge by a bridle-way sign stating "Scar End 4 miles", and then continue straight ahead. Just prior to the house, go through another wooden gate, and then head across the field using the track to the farm buildings ahead. Go through the first gate, then almost immediately through a second. Then continue on in the same direction on the now tarmac track. Continue on past the electric pole, past a breezeblock construction cowshed, heading for another farm building straight ahead. Go past this second cowshed and continue along this walled lane over a cattle grid. Continue on to a fork in the lane, where the left fork is taken, which passes immediately over another cattle grid following the Whernside sign. The lane passes in front of another house and over a small bridge, and immediately passes another couple of cottages. The path goes on past one last outbuilding where the track again becomes rough underfoot. Pass through a gate, and as the path levels the signal-box can again be seen straight ahead. The path pulls in alongside a stream and swings around to the right heading for the archway underneath the railway line. Pass through a wooden gate then under the tunnel. Turn right back onto the original path and follow this path back alongside the railway and the Ribblehead viaduct back to the car park.